Lori and I spent the day up north seeking out a few birds that I need for the Big Year contest. We drove up to Milford PA last night and spent the night at the Myer Motel cabin. Milford PA is just across the river from New Jersey and just across the state line from New York. It's up there. It's a cute little town which I highly recommend for a weekend. We didn't stay long - arrived at 9::30 PM and left at 4:45 AM. We started the day at Old Mine Road on the Jersey side of the Delaware Water Gap. This road is "legendary" for birding in NJ. It runs about 20 miles along the river through state and and national park which is really terrific. We started at the southern end and drove very slowly with the windows rolled down listening for warblers. 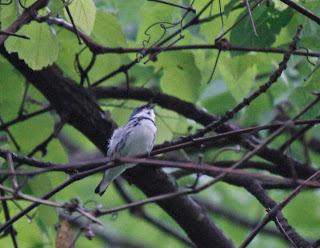 Our target bird was Cerulean Warbler which is pretty rare and only found in woods along rivers. I need this bird for the stupid contest and Lori has never seen one which means that it would be a "Life Bird" for her. We stopped along the road every few hundred yards and listened for the call. We heard all types of birds including Wood Thrushes and Veeries, and many types of warblers including Louisiana Waterthrush and Redstarts, but no Cerulean. I heard a really weird song while driving slowly along the road which we stopped to investigate. Being the awesome birder that I am - I couldn't figure out the song and finally saw the bird which I chalked up to a Blackpoll warbler. Then Lori said "Um . . . Lin . . . this bird is blue. Blackpolls aren't blue are they?" Of course not. Blackpolls are BLACK - hence the name. Ceruleans are blue - hence the name. Bingo, we got the bird. Here is a terrible photo. I also have a video which does not show the bird since I can't figure out how to aim the camera while taking video. We saw a ton of birds including some other Life Birds for Lori. I'll post the rest of the day later.